Rate-of-Rise feature differentiates between cooking and a real fire. Reduces the chance of nuisance alarms from cooking steam. Provides a decade in peace of mind. 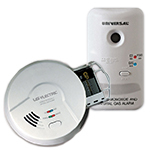 Never replace batteries for 10 years, saving up to $38.00 over the life of the alarm. 10 year product end‐of‐service life warning sounds when it is time to replace alarm. 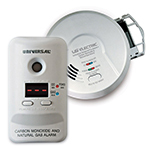 Meet New Laws & Legislation‐‐This alarm exceeds industry standards, and is listed to UL Standard UL 217 and is California State Fire Marshal approved. ECO Friendly, reduces environmental waste & eliminates disposal of up to twenty 9 volt batteries. The sealed battery (included) will never have to be replaced throughout the life of the alarm, giving you a decade's worth in peace of mind even in the event of a power outage. Permanent Power also saves money from battery replacements (up to $38.00 over the 10-year life of the alarm), eliminates annoying low battery chirps and helps the environment by reducing environmental waste from disposed batteries. 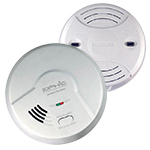 The perfect replacement for existing USI Detectors, this USI Smoke and Fire Alarm features a large mounting base to cover imperfections in drywall and the option to replace retrofitting applications. The quick activation battery pull tab makes it easy to install while the deactivation key switches the alarm off and makes the alarm safe for disposal. Once the alarm is deactivated, the tamper resistant feature turns on to prevent deactivated alarms from being reinstalled. This alarm conforms to UL 217 Standards. It has also been approved by the California State Fire Marshal and Federal Housing Authority (FHA) to exceed industry standards. For maximum protection, install an alarm inside every bedroom, outside every sleeping area and on all levels. The Universal Security Instruments MI3050SB 2-in-1 Smoke and Fire Smart Alarm comes with a 10-year limited warranty that covers both the battery and alarm. Universal Security Instruments is a U.S. based manufacturer of high quality, easy-to-install home safety products. Founded in 1969, Universal Security Instruments has over 40 years of heritage in providing home safety products for families. With state-of-the-art manufacturing facilities, Universal Security Instruments continues to launch revolutionary new products and technologies with the mission of always working to keep families protected. Package Dimensions (W x H x D): 5.75 x 5.75 x 1.75 in. Reviewed: 05/12/2018 by Jen S.
I did a lot of investigation before I ordered new alarms. These had all of the options I wanted and they are so much cheaper than the other name brands. I installed them very easily myself and they have been great. Never had any false alarms. There are no annoying lights. I really like that they have different ones specifically for the hallway, bedrooms, and the kitchen. The previous brand I had in the kitchen went off every time I opened the oven. These don't since it senses the difference between steam and real smoke. These have USST technology which is much better than the other brands. I highly recommend this brand. Received in good order. A similar unit recently installed works very well. Would recommend to any purchaser. USI kitchen detector was easily and neatly installed. Performed very well in discriminating against steam from cooking. Eager to see performance with burnt toast. Like the sealed long lasting battery. Installed it on 8-3-16 and as of today no false alarms in the kitchen when preparing meals. I would recommend the 2 in 1, it's a great buy! We didn't get anything going in the kitchen yet to test it, but it installs very easily. Everything is great, very happy with the product that its has both types of sensors.